The Bright Angel Trail is considered the park's premier hiking trail. Well maintained, graded for stock, with regular drinking water and covered rest-houses, it is without question the safest trail in Grand Canyon National Park. There is a ranger station located at the trail's halfway point (Indian Garden) and one at the bottom of the canyon (Bright Angel Campground). Visitors hiking for the first time at Grand Canyon often use this trail in conjunction with the South Kaibab Trail. Particularly during hot weather, it makes sense to ascend via the Bright Angel Trail because of potable water, regular shade, emergency phones, and the ranger presence. Following a natural break in the cliffs formed by the massive Bright Angel Fault, today's Bright Angel Trail approximates a route used for a millennia by the many Native American groups that have called the Grand Canyon home. Early western pioneers at the canyon first built a trail in 1891 to reach mining claims established below the rim at Indian Garden. Recognizing that the true worth of the claims would be measured in visitation by tourists, these pioneers immediately registered their trail as a toll road and extended the trail to the river. The mining claims and use of the trail as a toll road would be the source of much controversy, first in legal battles with railroad companies that wanted to control tourism and later with the federal government. The trail was turned over to the National Park Service in 1928. Though it has been rerouted and improved considerably over the years, present day visitors on the Bright Angel Trail can sense its rich history from ancient pictograph panels and historic structures, and by marveling at the trail's construction over some of the roughest terrain in North America. While the South Kaibab Trail follows a ridge line, the Bright Angel Trail follows the head of a side canyon. Views on the Bright Angel Trail are framed by massive cliffs, and by virtue of being a shadier trail with natural water sources, there is more plant life and animal life along the Bright Angel Trail than on the South Kaibab Trail. These features make the Bright Angel Trail appealing to those interested in geology and in viewing wildlife. The majority of this trail's elevation change takes place in the upper four miles of trail via a series of switchbacks that can seem endless. Be sure to utilize the resthouses and seasonal water sources along the way (there are composting toilets at Mile-and-a-Half Resthouse, but no toilets at Three-Mile Resthouse). Whether ascending or descending, it is worthwhile to take breaks regularly. Approaching Indian Garden, the trail flattens out considerably as it crosses the shaley and desolate Tonto Platform. Indian Garden is an oasis in the canyon used by Native Americans up to modern times. Ralph Cameron, one of the early pioneers who built the Bright Angel Trail (and who would later become an Arizona senator), by 1903 had come to an agreement with the resident Havasupai allowing him to build a camp for tourists. He staked mining claims to secure the site, built tent cabins, and planted the enormous cottonwood trees still present today. 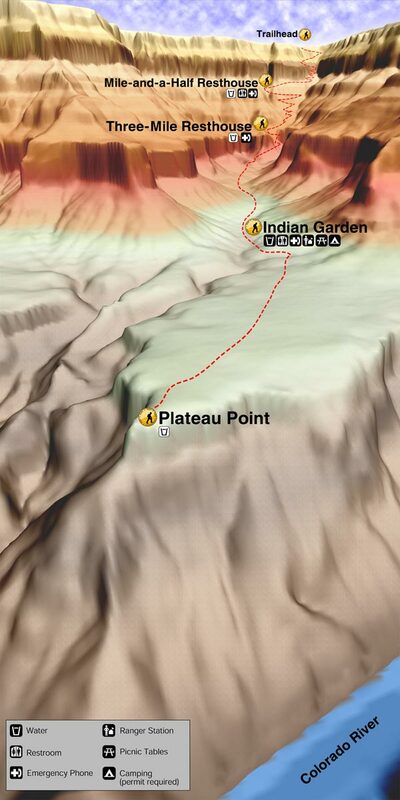 Hikers camping at Indian Garden should consider the mile and a half side trip to Plateau Point. Below Indian Garden, the trail follows a creek through a meandering gully of water-sculpted stone and shimmering cottonwood trees. The trail becomes steep once again where this gully empties into the broad, bowl-shaped Pipe Creek drainage. This section of trail, affectionately referred to as the Devil's Corkscrew, is brutally hot during the summer months and should therefore only be attempted during the early morning or late evening hours. There are no potable water sources between Indian Garden and Bright Angel Campground. A composting toilet is located near the River Resthouse. From the Pipe Creek/River Resthouse area to Bright Angel Campground, the trail traverses exposed sand dunes for over a mile until reaching the silver bridge across the Colorado River. Again, during hot weather, these sand dunes become a dangerous slog. During summer months there is potable drinking water at Bright Angel Campground, Indian Garden Campground, Three-Mile Resthouse, and Mile-and-a-Half Resthouse. From mid-October to early May, water is only available at Bright Angel Campground and Indian Garden. There is never potable water available at the River Resthouse. Please note that, due to occasional pipeline breaks, potable water is not guaranteed: bringing an alternative form of water treatment, such as iodine tablets or a water filter, is essential. Along the Bright Angel Trail, the only campgrounds are at Indian Garden (CIG) and Bright Angel Campground (CBG). At-large camping is not permitted on Corridor Trails; visitors must camp in designated campgrounds. Grand Canyon is, above all else, a place of extremes. Even though Bright Angel Trail has been constructed with visitor safety in mind, it is necessary to take appropriate precautions depending on seasonal variations in trail conditions. During winter months, the top 2 miles or so of this trail is particularly icy: Because the wintertime sun never reaches the trail, it will remain slick for weeks or even months after a snowstorm, so in-step crampons and hiking poles are recommended. From May to September, it is critical that hikers have the discipline to begin hiking well before dawn. Hikers should plan on reaching either their destination or a place where they might take a shaded siesta before 10 in the morning (average descent time from rim to river is between 4 and 6 hours). Similarly, when ascending from Bright Angel Campground during hot weather it is important to reach Indian Garden before 8 in the morning. 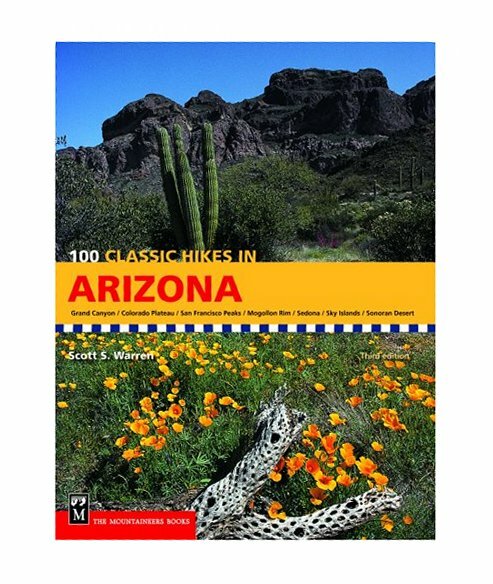 It is best to hike during the fall or spring hiking seasons.